I am happy to announce that next Monday I will be chairing and event where we will have Dr Robert Young giving a talk at Sydney University. This is a joint event organised by the Geocoastal Research Group, the Natural Hazards Research Group, the Australian Coastal Society and the Sydney Environment Institute. We sincerely thank Tom FitzGerald for doing most of the work leading to this event. Dr Young is the Director of the Program for the Study of Developed Shorelines, a joint Duke University/Western Carolina University venture. 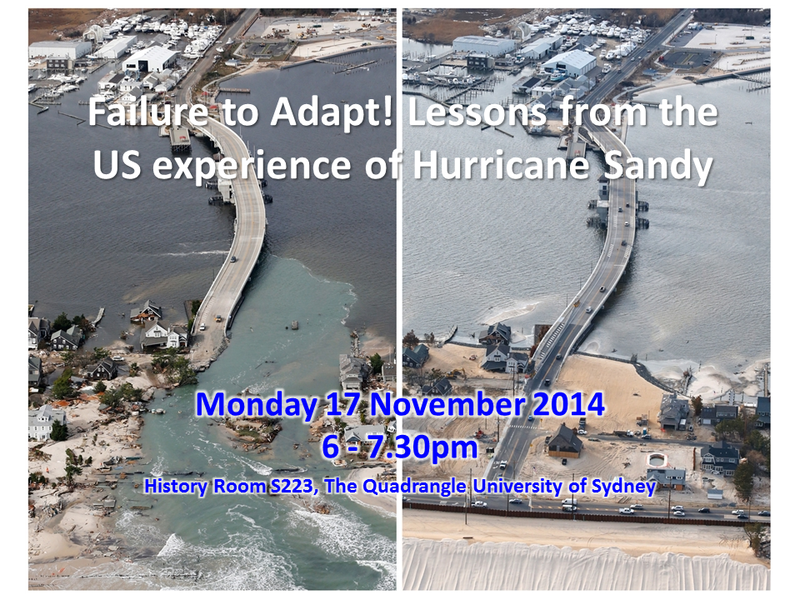 He will talk about how the USA responded to the impact of Hurricane Sandy. Right after Sandy hit the USA, there were talks about the need to ensure that rebuilding had to be done taking into account long term trends of coastal evolution; expected climate change and associated sea level rise should be taken into account instead of just rebuilding. The reality, two years later, is somehow different and Dr Robert Young will tell us all about it. What happened after Hurricane Sandy? What is being done for rebuilding? Have we learnt any lessons from this horrible experience?? Please join us next Monday to find out! ← Update from Heron Island. Pulling up those fossil coral monsters! Is this slideshow avail anywhere online? Would love to see it!